The basics of pruning–What Happens When We Prune a Plant – Johntheplantman's stories, musings, and gardening. Pruning season is coming up. I wrote this article some time ago in answer to the many questions I receive about pruning. It’s really a very simple process. Growing a plant is one thing. 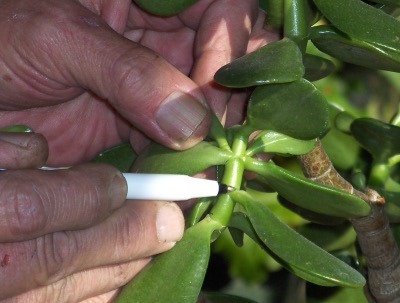 Shaping plants well is an art form and adds another dimension to your plant growing experience. Here is an article that tells you what happens when you prune. This information applies to just about any kind of shrub or tree. I am using a jade plant for pictures because the buds show up well. 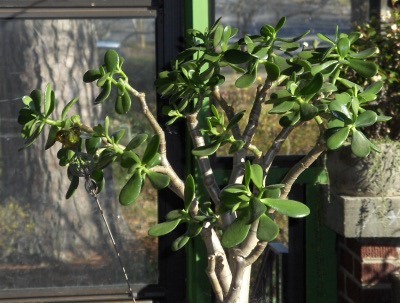 The jade tree is also really good for an indoor bonsai. 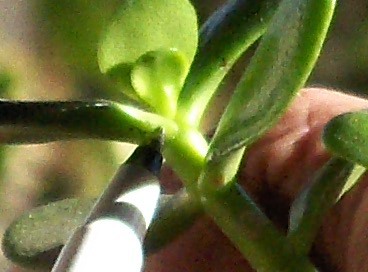 To start with, look at the tip of a stem and notice the small growth bud. This is called an “apical bud”. Here’s how plant growth works. The growth of the stem and buds is regulated by a group of hormones called “auxin compounds.” The apical bud is dominant and it draws all of the auxins up past the lateral buds. This enables the apical bud to develop and causes the lateral buds to remain semi dormant. 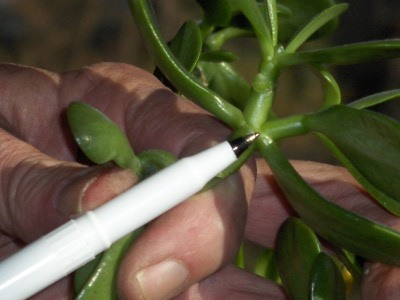 When the apical bud is removed by pruning, the lateral buds in turn become apical buds and start the elongation required for turning into a stem. 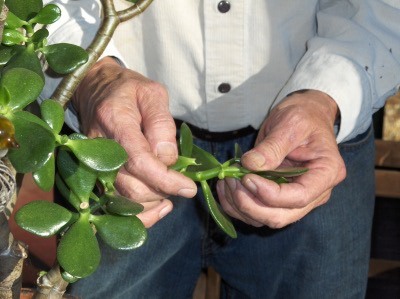 In a jade tree, the branching forms as two stalks as in the picture below. Pruning helps the main trunks to develop and get bigger and stronger; this gives you a stronger and healthier plant. 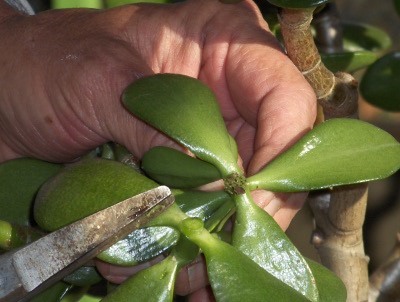 If you remove the lower leaves and/or growth from the stems, the stems will turn into well defined trunks. This is the principle behind bonsai, topiaries, and other shaped trees and shrubs. I haven’t been there for a long, long time, but I once visited a monastery in Conyers, Georgia that specializes in bonsai. The priest who was in charge said, “you should prune a tree so that a bird can fly through it.” I have remembered that concept and I use it a lot as I shape such trees as Japanese maples (click here for an article on pruning Japanese maples). 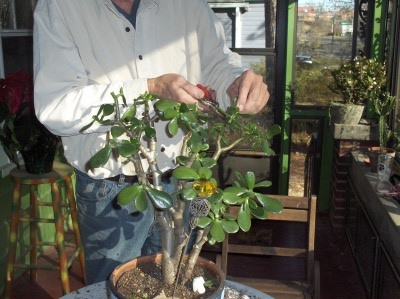 Here is the picture of the jade tree after the pruning is finished. All of the tips have been removed and it is time to grow it out. One of my next articles will be “how to start your very own bonsai.” Keep in touch. A Second Try for a Deer Proof Hillside Planting. Pingback: Pruning and Shaping Techniques for Trees and Shrubs | Johntheplantman's stories, musings, and gardening. Pingback: Pruning Azaleas in May-June. Follow These Instructions For Better Shape and Many More Flowers. | Johntheplantman's stories, musings, and gardening. 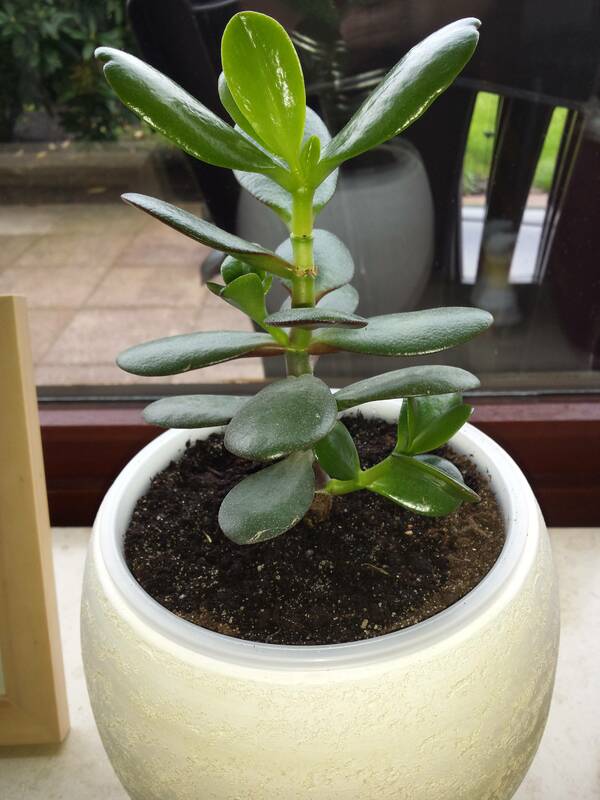 Hi, i have a jade plant that was propagated from a larger one since April, it is now August and has grown significantly. However, it has really grown much branches. I was wondering whether I should start picking off a few leaves to help it to grow? I have never pruned a plant/tree before so am not sure where to start. I would like the plant to grow taller but also with more branches, like a tree. Any advice? I would start by removing some of the lower leaves to start trunk development. Then punch out the apical bud.